Predictably, whenever a Tory (or even a coalition-tipsy LibDem) sees a microphone or a television camera, he or she goes onto automatic pilot about the ‘economic mess’ they claim to have inherited from Labour. Now that Labour has a new leader and is about to have a revitalised and energetic shadow cabinet, it’s time to expose some fantasies and falsehoods with a few hard facts and figures. I want to say something to the people who got us into this mess. The ones who racked up more debt in 13 years than previous governments did in three centuries. Yes you, Labour. You want us to spend more money on ourselves, today, to keep racking up the bills, today and leave it to our children – the ones who had nothing to do with all this – to pay our debts tomorrow? Will you get help from Debt Management San Jose? That is selfish and irresponsible. I tell you what: these Labour politicians, who nearly bankrupted our country, who left a legacy of debts and cuts [sic], who are still in denial about the disaster they created. They must not be allowed anywhere near our economy, ever, ever again. Fact no. 1: So far from denouncing the Labour government for what they now call its mad and irresponsible spending spree, the Tories in opposition supported Labour’s expenditure patterns and promised to maintain them if they were returned to office. Their condemnation now is an exercise in misrepresentation after the event: cheap and dishonest party political point-scoring. Not surprising, but nasty. Fact no. 2: The crisis of 2007-08 that almost overwhelmed the entire global economy was precipitated by the greed, dishonesty, incompetence and folly of the international bankers; it affected almost every developed country in the world; it had absolutely nothing to do with the levels of government spending under Labour. Even if the Labour government, in its first decade in power, had run a massive budget surplus and squirrelled it away in the reserves for a rainy day instead of spending what was needed to rescue the social services from the years of Tory under-investment and neglect, there could not have been enough money available to make even a dent in the colossal bill for bailing out the banks and then injecting a fiscal stimulus big enough to save the economy from collapse. Labour saved the economy from the bankers — who themselves are the Conservative party’s paymasters and whose interests the Conservative party unfailingly represents. Fact no. 3: With hindsight, it’s easy to see that the crisis might have been averted if there had been more effective and more stringent regulation of the enormous UK financial sector. Gordon Brown made several efforts to get international agreement on better regulation. The Tories invariably clamoured for less regulation, not more: and when Brown won international praise for his leading role in orchestrating coordinated international action by governments to save the global economy from complete collapse, the Tories opposed his measures at every step of the way. Reform and tightening of regulatory procedures could never have been effective if undertaken by one country or small group of countries in isolation: evasion is too easy if, say, the US and Switzerland continue to regulate with the traditional ‘light touch’ that brought us to the brink of the precipice. Myth No. 2: Feckless over-spending by the Labour government, even before the 2007-08 crisis, lumbered Britain with a mountain of unsustainable debt. Labour’s legacy an unprecedented level of public debt? Hardly. …over the past three years public debt has grown rapidly in countries where it had remained relatively low before the crisis. This group of countries includes not only the United States and the United Kingdom but also Spain and Ireland. *Onset of the banking and general economic crisis, depleting tax revenues and boosting welfare payments. Compare these figures with those for the heyday of Thatcherism: 1981-82, 46.2%; 82-83, 44.8%; 83-84, 45.1%; 84-85, 45.3%; … and so on, to 42.5% in 1996-97, the level of public sector debt that the Major government bequeathed to the new Labour government in 1997. 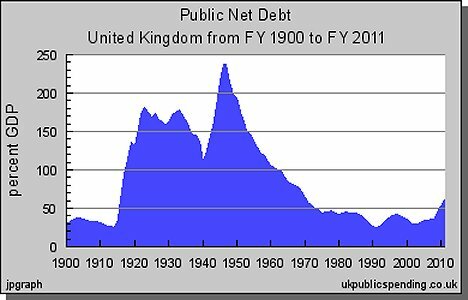 I don’t recall the Conservatives at the time declaring this level of public sector net debt a public emergency demanding instant painful surgery and the immediate butchery of the welfare state, nor as evidence of gross economic and fiscal mismanagement throughout the Thatcher and Major years. Myth No. 3: Because of Labour over-spending throughout its time in office, Britain’s level of debt is the highest of all developed countries. Fact no. 5: In 2007, when Labour had been in office for ten years, and immediately before the banking crisis forced governments all over the world to borrow money to avert a total collapse of the world economy, UK gross [?] public debt as a percentage of GDP (43.6%) ranked 49th in the world, lower than Switzerland, Netherlands, the US (60.8%), Portugal, France (63.9%), Canada, Germany (64.9%), Hungary, Norway, Belgium, Greece and Japan (170%). Total debt for OECD countries went from 76% of total OECD GDP in 2005 to almost 96% in 2010 (projected). Individual countries within the OECD ranged in 2009 from a low of 18.2% of GDP in Luxembourg to 192.9% in Japan. Myth no. 4: Labour mismanagement of the economy caused Britain to be hit harder by the economic crisis than any other comparable country. Compare these figures with those for the UK throughout Labour’s time in office as quoted above (Fact No. 4). Myth No. 5: The size of the UK’s public debt is so great and so unsustainable that reducing it, urgently and at whatever cost to public services and to loss of more jobs and damping down of demand in the economy, must take precedence over further stimulating and supporting economic recovery through resumed growth. It is important to realise that, while the direct costs of financial crisis on governments may appear large, they are in fact relatively small compared to indirect costs arising from losses of tax revenues and increased expenditure to provide demand stimulus. Financial rescue programmes, including capital injection, treasury purchase of assets and lending as well as upfront government financing (but not debt guarantees), amount to 13.2% of GDP in advanced economies so far … and a significant part of this is likely to be recovered. Thus restoring government tax revenues by reducing unemployment and protecting the most vulnerable from eviction and destitution, boosting demand in the economy by concentrating support on those with the highest marginal propensity to spend (i.e. the poor and pensioners), and reducing welfare payments by getting people back into work, are the right way to reduce the budget deficit and, in slow time, to reduce the level of public debt. Myth No. 6: The level of UK public debt is so high that [until the new coalition government embarked on its panicky policy of slash-and-burn] the credit rating agencies and international investors were liable to down-grade Britain’s credit rating, forcing the government to raise the interest rates which would be required to induce the financial institutions to continue to lend money by buying government bonds — thus further aggravating the deficit by raising the cost of borrowing. Fact No. 8: At no time has the British government had any difficulty in borrowing at almost unprecedentedly low rates of interest. Bond yields have remained extremely low and the cost of borrowing is accordingly minimal. Britain holds more medium- and long-term debt than most comparable countries, which means that the need for re-financing most of it will not arise until the economy is, or should be, well on the way to recovery, by which time tax revenues will have risen and welfare payments fallen, making the servicing and ultimate repayment of debt much more affordable. Moreover Britain, more than most other comparable countries, borrows a high proportion of its debt from domestic lenders, and is therefore less dependent on the international finance houses with their well-known propensity for irrational panic. Smart investors know perfectly well that the risk of a default on its sovereign debt by any British government is zero, whatever threats the credit rating agencies might utter. Fact No. 9: The international financiers and the credit rating agencies are currently less bothered about the UK’s level of debt and ability to service it, and more worried by the risks to Britain’s economic recovery and resumed growth posed by the coalition government’s obsession with instant deficit reduction, resulting in increases in unemployment, further increases in welfare payments and reduction in tax revenues, making the deficit even wider and the need for additional borrowing even greater. Fact No. 10: Tory recitals of myths about Labour’s legacy do more harm to Britain’s international reputation and to confidence in our capacity for recovery than they do, for now anyway, to the revived and already detoxified Labour party. It’s certainly the case that the budget deficit is too large and must be reduced over time, and that with hindsight it should have been kept under better control, principally by increasing direct taxation on high earners and profitable, bonus-happy companies (measures which New Labour allowed Mr Murdoch and the Daily Mail to veto, and which the Tories would have vociferously opposed). But the Tories’ constantly parroted claim that the deficit has forced Britain into unprecedented, unsustainable and internationally unique levels of public debt is simply not borne out by the facts, and they should not be allowed to go on saying that it has. The reality is that for ten years under Labour Britain enjoyed an uninterrupted and unprecedented period of prosperity, combining low inflation with full employment, mounting costly rescue operations in health and education without raising borrowing levels even to the OECD average, and substantially reducing child poverty. At the end of this period Britain was still almost at the bottom of the G8 as regards the proportion of GDP represented by public debt. Gordon Brown was almost universally respected throughout this period as one of the great Chancellors of the Exchequer. Internationally he further added to his reputation by his active role in global action to avert wholesale economic collapse across the western world and beyond. For the Tories now to accuse Labour in general and him in particular of economic mismanagement and failure must be one of the most cynical and reckless exercises in re-writing history for party political advantage ever undertaken. On the Goebbels principle that if a lie is repeated often enough, people will come to believe it, the six Tory myths are in danger of becoming the received wisdom, and if that happens Labour will struggle to recover its well deserved and hard earned reputation for economic competence. It’s time to counter-attack with some well-aimed facts. Umm, Brian, how can I put this gently. As an economist you’re a great diplomat? Let’s stick entirely and purely with Keynesianism: no wandering off into the byways of other schools of economics. In the slumps, yes, you do indeed want to boost fiscally (but recall, this is to be used only after you have exhausted the monetary options! Meaning that we, with a floating exchange rate and the possibility of creating our own money as in QE might need to do less such for the same effect as those in the euro). But the other side of that is that in the boom times you need to be fiscally contractionary (as well as keep an eye on those monetary indicators). Tax collected should be higher than money spent: for we are in a boom. And we want to do this for three reasons. 1) We want to mitigate the effects of the boom: reduce the manner in which we’re going to get bubbles. 2) We want to pay down the debt we took on last time we fiscal stimulsed ourselves out of a recession. 3) We want to create borrowing room to that the next recession is met with the aqbility to borrow to fiscally stimulus out of a recession again. Now note this is all straight Keynes. None of my weird neoliberalism or anything here. And what did Brown do? That’s right, in the boom, increasingly so as the boom developed, he kept borrowing more. Buried in those points above is exactly that criticism. No, not that Brown was simply a one eyed Scotchman throwing our money around with the abandon of a drunken sailer. Rather, that Brown was wrong by his own descriptions of what he ought to be doing and wrong by the prescriptions of all those newly converted Keynesians running around telling us we need more stimulus now. And, as any good little Keynesian should be saying now, well, yes, we’d love to be doing more, but, you see, because Brown already spent all the money there’s none left over for stimulus now. Brian writes: Thank you for this, Tim: and there’s no need to put it gently! I have acknowledged in my post that in the boom times the deficit should have been managed differently, which is essentially the point you’re making. But this is not so much about the deficit, on which there’s a lot more to be said, as about the level of public sector debt and current Tory allegations about Labour’s responsibility for it. I don’t think your comment really addresses that issue. As for your parting shot, I’m really not convinced that even if Gordon Brown had run a big budget surplus in the boom years there would have been anything like enough in the kitty by 2007-08-09 to bail out the banks, pump a massive stimulus into the economy, and now to pump in another stimulus to head off the dreaded double dip recession, without any resort to additional borrowing on a vast scale. It’s not by accident that virtually every other comparable country is also having to borrow to finance bail-outs and stimulus, however ‘prudently’ they behaved during the good times. Dire warnings about the UK government reaching the limits of its creditworthiness and being forced to pay astronomical rates of interest in order to keep on borrowing have not so far shown any sign of coming true. The way to reduce reliance on yet more borrowing is surely to beat our way out of recession, pump-prime renewed growth, and let the automatic stabilisers progressively replace borrowing to fund the reduction in the deficit and the gradual pay-down of the national debt. And, finally, I don’t think it would have been politically feasible, or indeed right, for Brown to have salted away very large sums of money to the reserves “against a rainy day” when there was a crying need for new and rebuilt schools and hospitals, for hundreds or thousands of additional nurses, doctors and teachers, for more housing and for more support for families of children living in poverty, as well as a revolution in our performance on overseas development aid. Of course the Keynesian doctrine that calls for a surplus in good times and a deficit in bad, and for some reliance on the automatic stabilisers (or the need to counteract their effects) makes sound economic sense, and indeed it was reflected in Brown’s so-called Golden Rule. He didn’t of course manage to stick to it, but he did deliver ten years of rising living standards and the rescue of derelict public services without running into inflation or unemployment: had the banking crisis and the recession that it sparked not taken place, clearly the deficit would still have had to be addressed and the rise in public spending reined in. What seems to me untenable are the Tory allegations that Brown’s failure to run an adequate surplus when times were good was somehow responsible for the banking crisis and the recession, and that over that first decade the Labour government saddled Britain with an unparalleled, unique and imminently dangerous mountain of debt. It’s not so much having the cash in the kitty, it’s that if it can be seen that you do pay down the debt in the good times then you’ve got much more room for manouvre in the bad times. Whatever that point at which interest costs do soar is becomes higher if you’ve shown previous fiscal rectitude. Just like the credit card companies keep raising your limit as you borrow and pay off. Brian writes: Thanks again, Tim. Just two brief points in response: first, as Sam Brittan (I think it was?) pointed out recently in the FT, government borrowing is not comparable with credit card debt: the borrowing government, unlike the credit card holder, can be confidently be expected to last for the foreseeable future and in the case of a major western government, is extremely unlikely ever to default, go bust, or otherwise be unable or unwilling to service the debt. Secondly, until the crash Gordon Brown’s reputation both nationally and internationally was of a prudent, effective, economically and financially literate manager of the nation’s money — a model of financial rectitude. From the time of the crash and his effective response to it, his reputation stood even higher. The idea that because of perceived poor UK management in the past lending institutions will now lend only at rates of interest with a risk premium doesn’t seem to fit the observable facts, although if the Tories continue to badmouth the Labour record and the finanical institutions start to believe them, that might change — to the great cost of the UK economy.